Beading tutorial, Beading tutorial for beginners, Free beading tutorial, Necklace, Pendant, Triangle weave beading tutorial. Beading pattern, Beading tutorial, beading tutorial for beginners, Easy beading tutorial, Necklace beading tutorial, Triangle weave tutorial. You can try the Triangle weave lesson 2 in the practice without risk with this free tutorial. The beading pattern is very detailed. Step by step with illustrations and photos of each step, material list, color list, and finished pictures of the bracelet. Beading pattern with Swarovski bicone crystals and delica seed beads. You absolutely have to make this ring, if you love big and truly special jewelries. The Aglio ring is the next piece of the Aglio collection. 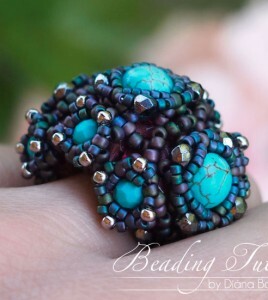 You can make this ring from 6 and 8 mm round pearls, fire-polished beads and seed beads. Aglio is a special segmented collection with a three dimensional structure. 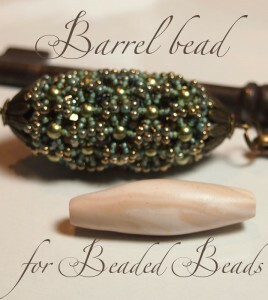 This collection will be a really unique piece of your beaded jewelries. The beading pattern is very detailed. Step by step with illustrations and photos of each step, material list, color list, and finished pictures of the ring. This pendant looks like a real oasis: the water in the middle of the plants in a desert. A beaded pendant from beautiful light turquoise Swarovski Rivoli crystal, and green Super Duo beads.